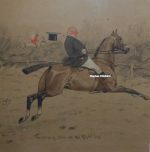 The Tom Carr etchings and prints below represent a small selection of the many Hunting, Racing, Polo, Pig Sticking and Military works available. If there is any Tom Carr painting in particular that you are looking for then please do not hesitate in contacting me on 07889 800857. 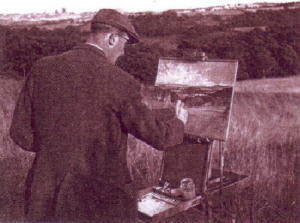 Carr specialised predominantly in hunting scenes, mainly of the Northern Hunts (The Jed Forest and the Braes of Derwent), but works also exist of the Dukes of Beauforts, The Quorn, The North Northumberland and of the Heythrop, having spent two seasons with the latter. 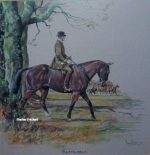 He also frequented many races and point to point, examples of which are also available. Tom Carr also studied dry point etching under George Vernon Stokes and produced many limited editions etchings of his hunting scenes in small editions, making them highly collectible. Etchings also exist of gun dogs and shooting scenes, though not of the quality of his hunt etchings. Carr’s original work comes rarely onto the market but when it does is usually highly priced.